› Author AffiliationsThe work is supported by the National Postdoctoral Fellowship (PDF/2016/001539) from SERB, New Delhi, India to RD and grant SB/S1/OC-48/2013 from SERB, New Delhi, India to BM. A glycosyl dithiocarbamate derivative is developed as a ‘turn on’ fluorescent sensor for fluorides in aqueous medium. The probe is prepared through a simple chemical strategy reported earlier from our group. 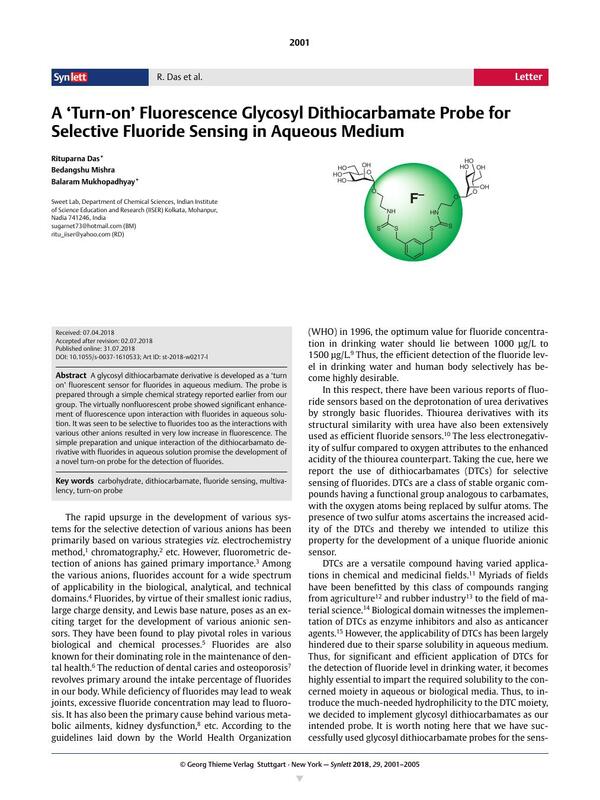 The virtually nonfluorescent probe showed significant enhancement of fluorescence upon interaction with fluorides in aqueous solution. It was seen to be selective to fluorides too as the interactions with various other anions resulted in very low increase in fluorescence. The simple preparation and unique interaction of the dithiocarbamato derivative with fluorides in aqueous solution promise the development of a novel turn-on probe for the detection of fluorides. Supporting information for this article is available online at https://doi.org/10.1055/s-0037-1610533. 17 Detailed Procedure for the Synthesis of Compound 1 (Scheme for the Synthesis Given in the Supporting Information) Azido Ethyl 2,3,4,6-di-O-isopropylidiene-α-d-mannopyranoside (3) To the mixture of known compound, azidoethyl α-d-mannopyranoside (2, 5.0 g, 20.1 mmol) in anhydrous acetone (50 mL), 2,2-dimethoxypropane (7.4 mL, 60.2 mmol) was added in the presence of catalytic amount of camphor sulfonic acid (CSA). The reaction mixture was allowed to stir at room temperature for 3 h until the TLC (n-hexane/EtOAC = 2:1) showed the complete conversion of the starting material. The reaction was then neutralized using triethyl amine and subsequently the solvents were evaporated in vacuo to yield the crude mixture. The fastest moving spot was separated by flash chromatography to yield azidoethyl 2,3,4,6-di-O-isopropylidiene-α-d-mannopyranoside (3, 5.4 g) in 82% yield as a clear syrupy compound. 1H NMR (500 MHz, CDCl3): δ = 5.06 (s, 1 H, H-1), 4.2 (d, 1 H, J 1,2 < 1.0 Hz, J 2,3 = 5.5 Hz, H-2), 4.15 (dd, 1 H, J 2,3 = 5.5 Hz, J 3,4 = 8.0 Hz, H-3), 3.87 (m, 2 H, H-6a, CH2), 3.75 (m, 2 H, H-4, H-5), 3.6 (m, 2 H, H-6b, CH2), 3.41 (m, 2 H, CH2), 1.54, 1.51, 1,42, 1.35 (3 s, 3 H, 4 × CH3). 13C NMR (125 MHz, CDCl3): δ = 109.5, 99.7 (2 × C(CH3)2), 98.1 (C-1), 75.9, 74.8, 72.6, 66.5, 62.0, 61.6, 50.4, 29.0, 28.1, 26.1, 18.8 (4 × C(CH3)2). HRMS: m/z calcd for C14H23O6N3Na [M + Na]+: 352.1485; found: 352.1499. α,α-Bis-2,3,4,6-di-O-isopropylidiene-α-d-mannopyranosyl-aminodithiocarbamato-m-xylene (7)Azidoethyl 2,3,4,6-di-O-isopropylidiene-α-d-mannopyranoside (3, 1.0 g, 3.0 mmol) was dissolved in MeOH (50 mL) and subjected to catalytic hydrogenation through a 10% Pd-C cartridge through ThalesNano hydrogenation assembly. The reduced product, amino 2,3,4,6-di-O-isopropylidiene-α-d-mannopyranoside (4, 856 mg) was obtained after evaporating the solvents in vacuo in 93% yield. The compound 4 was directly used for the next multicomponent reaction. To the mixture of 4 (856 mg, 2.8 mmol) in dioxane (10 mL), CS2 (5, 102 μL, 1.7 mmol) was added dropwise and allowed to stir at room temperature for 15 min. Following this, dibromo-α,α-m-xylene (6, 396 mg, 1.5 mmol) dissolved in dioxane (10 mL) was added to the reaction mixture over 5 min and allowed to stir under similar conditions for 30 min. NEt3 (1 mL) was then added and the pH adjusted to ca. 9.0. The reaction was continued for 30 min. The solvents were then evaporated in vacuo. The crude mixture was then dissolved in CH2Cl2 (25 mL) and washed with H2O (2 × 25 mL). The organic layer was then collected, dried over Na2SO4, and filtered. The solvent was then evaporated and was subjected to flash chromatography to yield the product 7 (787 mg) in 61% yield. 1H NMR (500 MHz, CDCl3): δ = 7.37–7.26 (m, 4 H, ArH), 5.02 (s, 2 H, H-1), 4.53 (s, 4 H, CH2), 4.15 (m, 4 H, H-2, H-3), 4.03 (m, 2 H, CH2), 3.88 (m, 6 H, H-6a, CH2), 3.75 (m, 6 H, H-4, H-5, CH2), 3.69 (m, 2 H, H-6b), 3.53 (m, 2 H, CH2), 2.04 (s, 4 H, NH), 1.54, 1.51, 1.42, 1.36 (4 × C(CH3)2). 13C NMR (CDCl3, 125 MHz): δ = 198.1 (NHCS2), 136.9, 129.7, 128.9, 128.3 (ArC), 109.7, 99.8, (C(CH3)2), 98.2 (2 × C-1), 75.9, 74.8, 72.5, 65.4, 62.0, 61.9, 46.6, 39.8 (CH2), 29.0, 28.1, 26.1, 18.8 (C(CH3)2). HRMS: m/z calcd for C38H56O12N2S4Na [M + Na]+: 883.2614; found: 883.2676. α,α-Bis-α-d-mannopyranosyl-aminodithiocarbamato-m-xylene (1) The protected mannoside DTC derivative 7 (787 mg, 0.9 mmol) was dissolved in 80% AcOH (20 mL), and the reaction mixture was stirred at 80 °C for 6 h till the TLC showed complete consumption of the starting material to a slower moving spot. The AcOH was then evaporated and co-evaporated with toluene. The crude mixture thus obtained was purified by flash chromatography to yield the final compound 1 (571 mg) in 89% yield. 1H NMR (500 MHz, CDCl3): δ = 7.32–7.15 (m, 4 H, ArH), 4.75 (s, 2 H, H-1), 4.45 (s, 4 H, CH2), 3.85 (m, 12 H, H-2, H-3, H-6a, 3 × CH2), 3.67 (m, 10 H, H-4, H-5, H-6b, 2 × CH2), 3.51 (m, 2 H, CH2). 13C NMR (125 MHz, CDCl3): δ = 199.3 (CS2), 138.9, 130.9, 129.8, 129.2 (ArC), 101.7 (C-1), 74.7, 72.6, 72.1, 68.5, 66.0, 62.8, 50.0, 47.8, 40.1. HRMS: m/z calcd for C26H40O12N2S4Na [M + Na]+: 723.1362; found: 723.1401.